At a time when Republican trust in college overall is low, voters tend to keep supporting their local schools. There’s a unique tradition in Montana. Once every decade since 1948, voters have taken to the polls to give the state’s colleges a report card and decide whether or not they want to tax themselves to support the institutions. The tax, known as the six-mill levy, is a small charge on property that helps fund higher education. It provides about $20 million in funding for the state’s public colleges each year. The tax referendum has passed every time it’s been voted on since 1948, but this year the result wasn’t as certain, and education advocates feared the worst. But the measure ended up passing with 62 percent of the vote, the first time there has been an increase in support for it in four decades. Montana’s referendum was seen as a bellwether of whether distrust of higher education would translate directly into decreased funding—and its passage was taken as a positive sign for colleges. But the question of why it passed is an interesting one. And one that institutions may do well to pay attention to as state funding for higher education continues to dry up. Montana is already below the per capita national average on higher-education spending, Thomas Harnisch, a policy director at the American Association of State Colleges and Universities, told me. And if the referendum hadn’t passed, the defeat would have been a blunt blow to higher education in the state. “This ballot measure was one way to guard against potential cuts in program quality or tuition increases,” Harnisch says. Read: American higher education hits a dangerous milestone. The primary reason for concern: Distrust in higher education. Last year, a Pew survey found that the majority of Republicans lacked strong confidence in higher education. 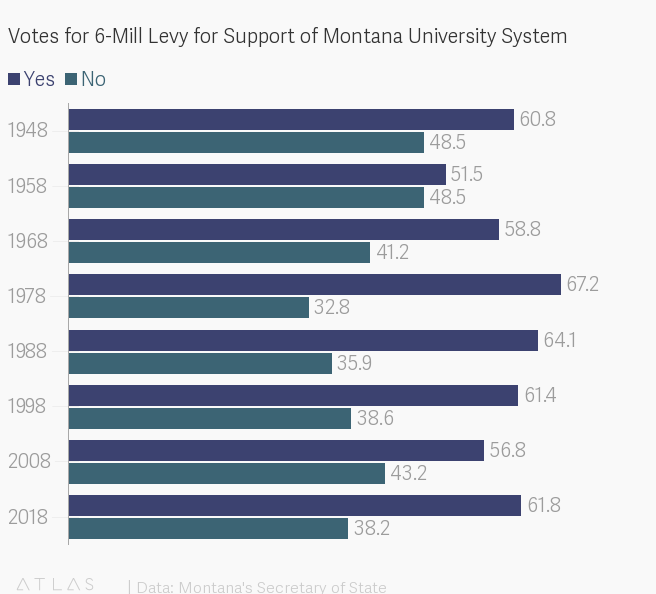 And in a deep-red state such as Montana, where support for this 70-year-old tax has fallen decade over decade since 1978, that distrust could have meant $20 million less for the public universities. “The political climate just seems so uncertain,” Bob Brown, a former state senator who is a member of the advocacy group supporting the tax, told me on Tuesday, before the election. “Before, we’ve been able to showcase what our universities have done in Montana,” he said, but “people were angry and seem to want to break things right now.” And he was worried that the thing they would break would be higher-education funding. But the voters didn’t break anything, and that’s likely a reflection of a phenomenon that other polls have found: Even though Americans—particularly Republicans—distrust higher education, they’re fond of their local colleges. And one reason people love the colleges near them is that they see the good the institutions are doing, Brown says, and disassociate them from the national higher-education enterprise. And that may have helped propel Montana’s tax to reauthorization. Read: Tuesday showed the drawback of Trump’s electoral bargain. The victory in Montana might be instructive for other universities. One of the major themes of last night’s election was the partisan divide over education among white voters. The Republican Party is now solidly the home of white voters without a college degree. And that might mean that the Republican concerns over the value of college will be increasingly shaped by those who have not attended one. But Harnisch says enhancing the image of colleges as “economic drivers” may stem some of that animosity.